"We don't know what the vase painters ate"
The March 2006 discussion about antiquities and provenance (or lack thereof) provided some interesting material (see "Is It All Loot? Tackling The Antiquities Problem", New York Times, March 29, 2006). The Metropolitan Museum of Art had just (Feb. 2006) signed up to an agreement with the Italian Government. This had included the (in)famous Attic Euphronios krater. 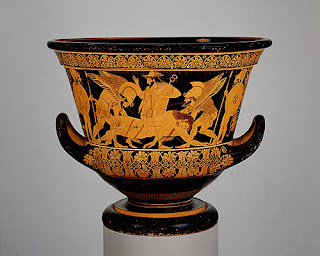 I think the reality, since we have been talking about the Euphronios vase, is that the knowledge that we have of Greek vase painting is based 98 percent on vases that were never excavated by licensed archaeologists. Archaeologists talk about the loss of context. We have almost a totality of the possible knowledge we could have, although we don't know what the vase painters ate. only some 13 per cent comes a relatively secure archaeological context, and 50 per cent have no archaeological context at all. the interest of which is 98 per cent in its sheer existence (we know who made it, when and where) with only a 2 per cent loss in knowledge of what Etruscan grave it came from. Both De Montebello and Boardman belittle the importance of context. But can either of them answer these questions with certainty? Can we be sure that the Euphronios krater was found in Etruria? If so, which site? Which cemetery? Which grave? Where was it placed in the tomb? What was the status of the person buried in the tomb? What was the date of the burial? What other objects were placed alongside the Euphronios krater? How does the iconography of "Sleep" and "Death" on the krater link to the iconography of other funerary objects from the same tomb? the problem with the notion that on a providential zephyr an object will somehow return to its context by being returned to the country it came from. Who believes that "repatriation" restores context? Archaeologists do not. "Repatriation" merely recognises that an illegal action has taken place. The tragedy is that looting has deprived the Euphronios krater of its archaeological context which can never be restored by scholarship or "connoisseurship". Where can one find a copy of the interview in which de Montebello makes this statement? I've seen several comments of his posted in other media that echo a similar statement, but none post-repatriation of the Euphronios krater. It's also in line with another statement of his in the early 70's decrying the lack of aesthetic appreciation by archaeologists for the piece as an art object. The debate is quoted in the New York Times which is linked at the beginning of the posting. D.W.J. Gill, review of Robson, E., L. Treadwell, and L. Gosden. Editors. 2006. Who owns objects? The ethics and politics of collecting cultural artefacts. Oxford: Oxbow; and Brodie, N., M. M. Kersel, C. Luke, and K. W. Tubb. Editors. 2006. Archaeology, cultural heritage, and the antiquities trade. Gainesville, FL: University Press of Florida. In Journal of Field Archaeology 32.1 (2007) 103-06. "The right to everything that's in the ground"
Modern-day Maecenases or robber barons? Cultural Ceasefire: is 1970 the right date? Coins and Cyprus: why is the ACCG filing a suit? Minerva: holding back on the detail? "The noose is tightening ": where next? "Buying good things with a legitimate provenance"
Returning antiquities to Italy: next moves?